March 24th marks the first day of the 10th annual Jewish Film Festival. 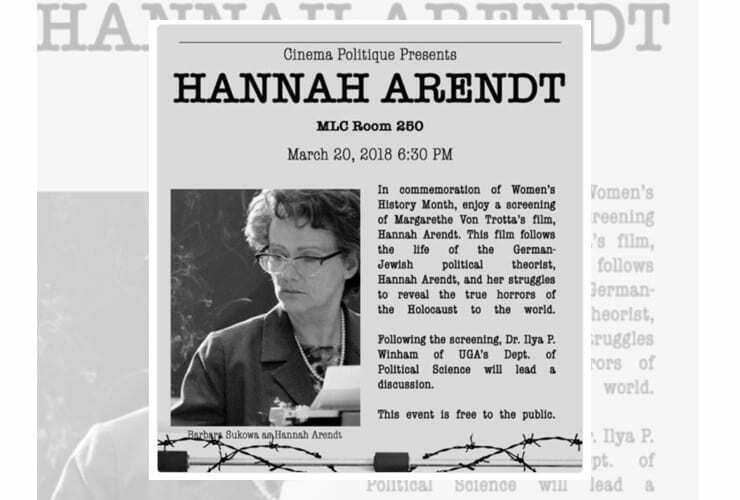 Before the festival begins, a special screening of “Hannah Arendt” will show on March 20th in the Miller Learning Center. Dr. Illya Winham, a lecturer in the University of Georgia’s Department of Political Science will introduce the film and lead the discussion. One of the topics for the festival is the Holocaust. This film focuses on Arendt’s struggles as a reporter for the New Yorker to reveal the true horrors of the Holocaust. The festival lasts from March 24 through March 28. For dates, times and showings, check out the below schedule.